The concept for the Vikings Tarot is from Manfredi Toraldo, who also created the Olympus Tarot and Durer Tarot while the artwork is by Sergio Tisselli. This theme deck depicts Scandinavian raiders who invaded and settled parts of Europe, Britain, and even North America in the ninth to eleventh centuries. They have a reputation for being barbarians, heroic and bloodthirsty warriors, but they also had a complex and diverse culture that included merchants, craftsmen, traders and farmers. Two distinct groups of gods in Norse mythology are represented. 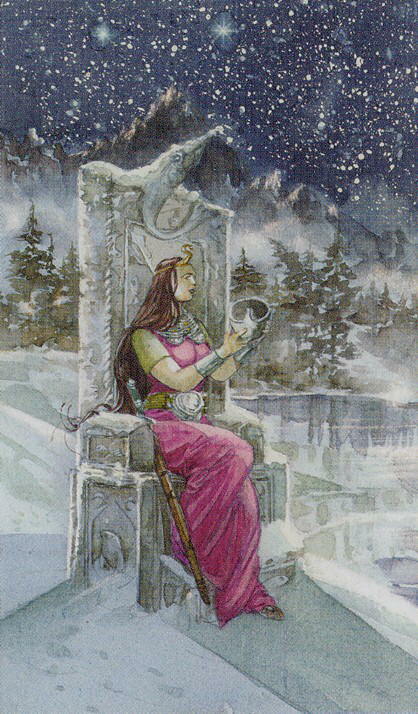 The Aesir are the supreme gods, like Loki, Frigg, Thor and Odin, and have been associated with the major arcana. The Vanir are the indigenous gods of agriculture and domestic life, and they have been linked with the suit of Chalices (Cups). Wands are represented by Giants, Pentacles by stocky, hairy Dwarves and blue-skinned, pointy-eared Elves. Men, as instruments of destiny represent the Swords suit. The Queen of Chalices is pink-clad with a diadem on her brow, and a large chalice cradled in both hands. She sits on the snowy shores of a reflective lake, and above her the sky blazes with a thousand stars.